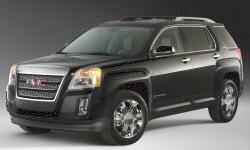 GMC Terrain Powertrain Performance Pros and Cons | Page 1 of 1 | Why Not This Car? Reviewers often praise the low-end torque of diesels, and the 1.6-liter turbo-diesel does out-twist the turbocharged 1.5-liter gas engine by 37 lb-ft (240 vs. 203). But it's still no match for the turbocharged 2.0-liter gas engine's 260 lb-ft. I first drove the new Jeep Cherokee with its base engine, a 184-horsepower 2.4-liter four-cylinder engine, and...waited until I could also drive the V6 before posting this review. While I liked the 2.4 in the related Dodge Dart, the Cherokee is too heavy for it, rendering acceleration sluggish and noisy. 4 clyinder engine performance very adequate. The engine and transmission are pressed pretty hard getting this car down the highway, at least when it comes to passing or hill climbing. It will downshift at the drop of a hat, even when in the "eco" mode. Downshifts are smooth but noisy. AWD, 264 HP, very responsive, great HP to fuel consumption ratio, IMO.